Many power transmission belts are of the "V" variety. Just like the ones in your car, they are usually made of a black tire-rubber-like material and have more of a trapezoidal cross section than that of a "V". 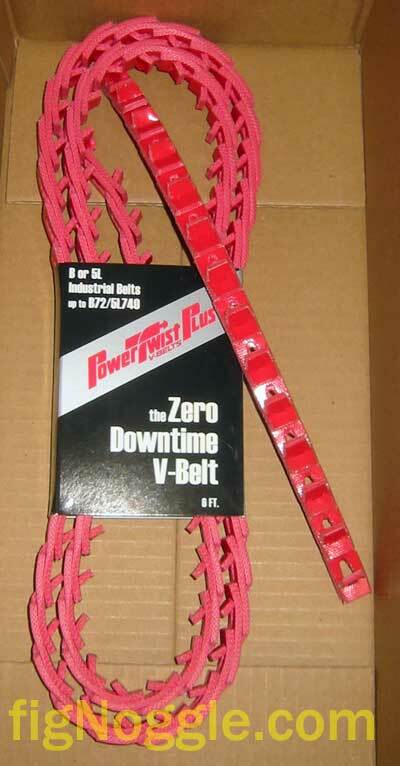 These belts are inexpensive to buy and install but can create or contribute to vibration in your machine. We recently purchased a round-column Rong-Fu 31 clone mill/drill and found the vibration in the entire machine (from motor to table and beyond) to affect the surface finish of the part being machined. One possible fix (yet to be verified, but we will perform some tests using a decibel meter, etc.. and report back) is to install another variant of the V-belt - the "adjust-a-link" style belt where you can simply by adding or removing links, shorten or lengthen the belt. 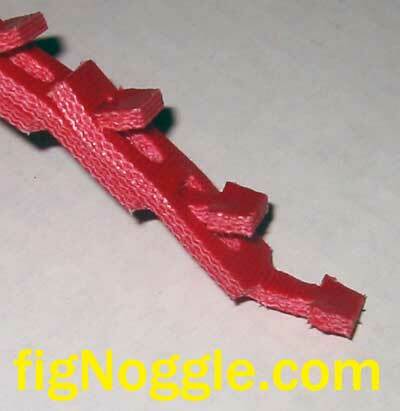 Each link consists of two holes and one tang which is inserted into another link. Thus, each link actually transfers forces across three links instead of just one as you would normally imagine with linkage-type systems. This could be considered a factor of safety approach to construction, but is more than likely designed to distribute forces across a larger area instead of concentrating them around a single point or other concentrated areas. Another point to make here is that the tangs are shaped in a trapezoidal fashion (like the v-belt) and makes the internal cross section for the belt. Removing these links requires some very tough hands, skin and fingernails, or better yet, a simple pair of pliers should be suitable for grabbing a link tang and twisting it such that it can be inserted through another link to make it free of the chain. Read about how we sourced this purchase.